Mendoza's Paint & Remodeling is proud to offer Interior Painting in Houston Texas. If you have ever tried painting the interior of your Houston TX home or business, you know that its not an easy task. Interior Painting is both a skill and an art. That's why Mendoza's Paint & Remodeling's professional interior painters must have several years of experience painting the interiors of homes and offices in and around Houston TX and be familiar with Houston's various interior architectural styles and building materials used in interior construction over the years. When it comes to affordable high quality interior painting Houston resident's can rely on, Mendoza's Paint & Remodeling is the interior painting contractor to call! 5★★★★★ - "We had Mendoza’s do a very large job for us. They painted our entire house, including all of our kitchen cabinets, crown molding, and base boards and of course the walls and ceilings. They did a fantastic job. The team was very professional and left our house as clean as you can with that size job every day. They were with us 2 weeks, and did a great job communicating with us as to what was coming next. They made sure we were happy with the quality and never complained even when I had them redo one room because of my mistake on the paint color - they wanted to make sure we would be satisfied and happy when the job was done. Highly recommend. I plan to use them again in the future." 5★★★★★ - "I am very pleased by the work Mendoza's professionals did on my house. The work crew was professional and polite. Jenny did a great job in communicating with me about the work being done and listened to my requests. I would highly recommend this painting company." 5★★★★★ - "Great work by Mendoza's Paint & Remodeling! They painted our living area, stairwell, half bath, and master bedroom and did a fantastic job. Jenny was very helpful when we were selecting colors too. The men working at the house were very respectful and courteous. They also worked very hard to keep everything clean and did an excellent job on cleanup one the product was finished. We liked them so much we're actually going to book them for two more projects. I highly recommend them." 5★★★★★ - "Competitive pricing, honest and reliable service, stands by his work. Any concern we had was addressed in a timely manner." 5★★★★★ - "We had all of our interior walls and trim repainted by Mendozas Paint & Remodeling and it looks beautiful! We painted the walls Repose Gray and the trim extra white and I couldn't be happier, it really brought this 14-year-old house back to life. Jenny was very professional and communicated well with me, she always responded promptly to my emails and questions. She gave me my estimate on Saturday and they were able to get started on that Monday. The painting crew was friendly, professional and most important of all they did a fantastic job! I will definitely use them in the future when we remodel our bathrooms and kitchen." 5★★★★★ - "Jenny and her crew were FANTASTIC! responsive and very detailed. Jenny offered suggestions which were good ideas to enhance my vision of the job. The job was precise and the details were perfect! I highly recommend Mendozas Painting and Remodeling!" 5★★★★★ - "I had a very good experience with this company. Jenny was very helpful in answering any questions I had and also making suggestions to the wall color, etc. The guys that did the work were pleasant, prompt and knew what they were doing to finish my remodeling in a reasonable amount of time. I highly recommend this company." 5★★★★★ - "Mendoza's arrived on Monday to paint the entire inside of our house. Ceilings, walls & accent walls plus painting the kitchen cabinets. I highly recommend Mendoza's. Their work ethic is a refreshing change from other contractors we have had experience with. They showed up on time every day and had the job almost totally completed by Wednesday of that same week. Jenny was very attentive to all of our painting requests which included the light switch cover plates and electrical plug cover plates. I have created a file folder specifically for them in my file cabinet in case I ever need painting to be done again!" 5 ★★★★★ - "Wonderful work by Mendozas Painting & Remodeling! 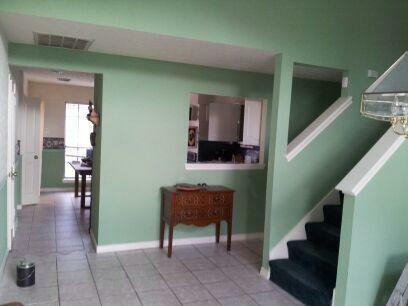 We painted multiple rooms and our hallway with very tall ceilings and they did an excellent job. The men who worked on our house were very professional and did a great job of cleaning up when they were finished. Jenny was also very responsive and helpful when we were deciding what to do. We're actually booking them for two more projects at the house since this one went so well!" 5★★★★★ - "I'm impressed with the quality work the staff at mendozas paint & remodeling did in my house. Very affordable prices and help me choosing a color to paint my kitchen since I was undecided. Very friendly staff thank you ! I will recommend"
5★★★★★ - "I had the exterior of my 1920's home painted & damaged trim repaired. Mendozas painting & remodel did a most excellent & thorough job. They really take pride in their work. Jenny was constantly in contact making sure everything was as discussed and up to par. Excellent work and customer service, they really want to make sure the job is to complete satisfaction. Very much appreciated and I will most definitely call them in the future!" 5★★★★★ - "Had my exterior repainted and Mendozas Painting remodeling did a fantastic job. They were good about suggestion colors for my house. They were courteous, neat and most of all affordable. Will be calling them back soon to get for my interior repainted." 5★★★★★ - "Mendoza's Paint & Remodeling did a great job painting my entire home. I repainted every wall in my home. Painting job for the entire home was complete in about 2-3 days and I found no flaws in the paint job itself. I found my shower curtain rod was broken in the process but Mendoza's team rectified the situation immediately. If I had to do it all over again, I would choose Mendoza's painting 100 times again." 5★★★★★ - "Mendoza's cabinet refinishing crew is fast without compromising quality. They were able to match the wall paint color and cabinet color to what I envisioned perfectly, at a reasonable price. I would recommend them for painting and cabinet refinishing and will look to use them again in the future for any refinishing or painting needs in my home." 5★★★★★ - "We have used Mendoza's for several projects now. The price is reasonable and they care about your satisfaction. They are responsive to our needs and have come back to do touch ups whenever we needed it. Jenny and her crew are polite and it's a pleasure to do business with them. Will recommend them time and again." 5★★★★★ - "I wanted to follow up with you and your crew. Your crew did an excellent job in the exterior painting of our home. Your recommendation for the color is spot on. We are very happy and glad we were recommended to you." 5 ★★★★★ - "We had our dark wood cabinets painted white and it looks like we have a brand new kitchen! The painters were very thorough and detail oriented. Jenny was involved with every step of the process and she was great to work with. I would highly recommend Mendoza's Paint & Remodeling." 5★★★★★ - "Jenny and the crew were simply a pleasure to work with. They were very professional and wanted to make sure that I was completely satisfied with their work. I couldn't have been happier! They matched colors as requested and made sure that everything was to my specifications. I am especially pleased with our upstairs den featuring the Houston Texans colors. All my guests love it. Thank you so much Mendozas for a job well done!" 5★★★★★ - "I am so happy with the work I had done by Mendoza's Paint and Remodeling. I had repairs done to pealing ceiling paint, old damage from Hurricane Ike. It's an open ceiling, where the living room, kitchen, and breakfast area are all connected. The damage was in sporadic locations throughout, and the major repairs were done to just those areas, but the end result is seamless and beautiful!" 5★★★★★ - "Mendoza's just finished painting the entire inside of our 3500 sq ft house. Did an excellent job, finished in 5 days, and the cost was more than competitive. Painted all walls, doors, and trim. In addition to painting we had our stairs banister stripped and re-stained darker. 5★★★★★ - "I called on a Wednesday to get an estimate to paint my entire home (interior): 3 bedrooms, 2 bath, laundry room, master closet, living/dining room, and kitchen. The estimate was completed the next day (Thursday), and they started painting on Friday....by 4 PM on Saturday ALL the painting was completed. The job was amazing! They did ALL the prep work, painted, cleaned up afterwards - leaving my home in near perfect condition. I will definitely hire Mendoza Painting & Remodeling for all my cutie projects." ★★★★★ - "We had all of our interior walls and trim repainted by Mendozas Paint & Remodeling and it looks beautiful! We painted the walls Repose Gray and the trim extra white and I couldn't be happier, it really brought this 14 year old house back to life. Jenny was very professional and communicated well with me, she always responded promptly to my emails and questions. She gave me my estimate on Saturday and they were able to get started on that Monday. The painting crew was friendly, professional and most important of all they did a fantastic job! I will definitely use them in the future when we remodel our bathrooms and kitchen." "Myself and my wife used Mendoza painting company to paint our new house. We were more than thrilled to see how great of a job they did with the different rooms we had them do for us. We will definitely be using them again when we decide to paint more of our new house. Thank you for the great job and especially the chevron wall in our guest room. It looks great." 5★★★★★ - "I wanted to follow up with you. Your guys did an excellent job!! And you recommendation for the color is spot on. We are very very happy." 5★★★★★ - "They just completed painting our house and we are very happy with the work. Jenny, Ricardo and Hector were very professional. They started and finished on time. Completed everything they said they would and little more. Quality of work is top class and we would hire them again." 5★★★★★ - "I had a great experience with Mendoza's Painting. Jenny came out and gave me a free quote to paint kitchen cabinets, ceiling and the walls in my kitchen and I hired them. I found them to be professional and courteous. They came on time, they cleaned up after themselves every day. My kitchen now looks beautiful. It was a great experience. There were no hidden fees or extras and some additional work I asked them to do they did for no extra charge. The price I was given stayed the same. Thank you very much and I'll recommend you to all my friends and will use you in the future." 5★★★★★ - "Very pleased with the prompt response and great work! They arrived on time, finished quickly, kept everything clean, and we’re very happy with the work. I would happily recommend them for any dry wall repair in the future!" 5★★★★★ - "Just completed another fabulous project with the help of Mendoza! Jenny and her team always come through with quality workmanship that also fits our budget. Happy customers, once again!!!" 5★★★★★ - "Very pleased with job done!" 5★★★★★ - "Mendoza's had the difficulty of correcting someone else's mistake. I had my kitchen cabinets painted by someone who misrepresented themselves and the result was beyond awful. Mendoza's came in, assessed, estimated and completed the job. The result is I love my kitchen now. They were always on time, led me through the entire process, and delivered exactly what I requested, going above and beyond my expectations. If you need a professional, honest and talented company, Mendoza's is the choice for you." 5★★★★★ - "Mendoza just finished my kitchen and I couldn't be more pleased. Wallpaper was removed, the walls retextured and painted. The cabinets were then painted and they look great. Thank you for a new kitchen." 5★★★★★ - "I can not say enough good things about this company. From the time I asked for an estimate to the time they were finished and actually asked for a final inspection, they did what they said they would do. And they did it very well for a very competitive price. I had them paint the entire exterior of my 2200 sf home including the brick, two car detached garage, garden room and 12 x 16 foot shed. I also had them repair the drywall and paint after I had the house re-piped. I could not tell were the plumbing work was done. It was like it never happened. Even under my kitchen counter in the cabinets. I will just say it, the best home service contractor I ever hired." 5 ★★★★★ - "I can't say enough good things about Mendoza's. They have painted my home office, three bedrooms, two bathrooms and installed flooring throughout my entire upstairs. Their crews always show up on time and stay on task all day. They even worked Saturday and Labor Day to finish my flooring project on schedule. Jenny is always very responsive and thorough. She provides clear quotes and then oversees the jobs to completion. Their workers are very polite and respectful of me and my home. They are careful and neat and I appreciate their professionalism. Their rates are reasonable and the quality of their work is top notch. I highly recommend Mendoza's for all of your painting and remodeling needs." 5 ★★★★★ - "I can not begin to tell you how absolutely satisfied I am with the work Mendoza's crew did on my kitchen cabinets. I had planned to get new cabinets but opted instead to paint them and they came out beautiful!! We have very good cabinets and changing them from white to grey has transformed our home. Aside from the wonderful work, the crew had the utmost respect for my home & they took great care in protecting all of the other areas around the kitchen while painting. They also came back to my home after we had new granite installed to touch up any cabinets the granite guys scuffed up. They went the extra mile :P Would highly recommend them!!" 5★★★★★ - "I had the kitchen completely done wallpaper removal, textured, ceilings and cabinets inside and out also the formal dining room, entryway stairwell, master bedroom and master bathroom cabinets done all at one time it was alot of work but the men at mendozas worked extremely fast all completed in 5 days amazing results they kept my house clean with no overspray anywhere and cleaned up completely prior to leaving everyday very professional company to deal with will be calling them back for the upstairs." 5★★★★★ - "Let me take an opportunity to rave about your company. I picked you from your website based on a vibe. Then we talked about what we wanted and you and your crew made it happen. The weather was against us and you were assuring us that our project needed to wait. You were right! Our deck was showcased for our family this Easter weekend. Since our deck is a family gathering place, they all were amazed at the incredible job you did! We will tell everyone the awesome job you did!" 5★★★★★ - "They did a great job painting my home. The crew was very professional they help move furniture around, because my wife is pregnant, they they taped everything, they painted inside the windowsills, they took off all the power covers, they cleaned up very well. I will definitely use them again when it's time to paint the nursery." 5★★★★★ - "First off, Jenny is a pleasure to work with and has a rapid response time. They provided their certificate of insurance which gave us peace of mind. In addition, they gave us extremely great service that I feel other competitors who wanted to charge twice as much would not have provided. The crew arrived on Friday December 26 to start the project, came back on Monday and were done the afternoon of New Years eve. Ricardo and his two crew members were very quick and efficient. If we had any concerns they explained what was happening and they corrected anything we were not happy with. Jenny would come to the house or call each morning to check on progress and to ensure we were satisfied. Without a doubt, I would hire Mendoza's Paint and remodeling again for any paint job that I have. In addition, I highly recommend them to anyone who is looking for top notch painters." 5★★★★★ - "Competitive pricing and work completed on schedule. I had my cabinets re-painted, they came in much cheaper than other contractors I had contacted and the work looks fantastic. They are now my go-to painting company for any future work. I would highly recommend." 5★★★★★ - "We hired Mendoza’s Painting & Remodeling to paint the interior walls of our home, install crown molding and re-paint our bath and kitchen cabinets. As do-it-your-selfers, we were hesitant to hire out, but we never quite got to this particular project so my husband and I decided to see what a contractor could do for us. Amazingly many contractors either never returned our calls, (including several we called from a popular referral web site), or once they did come out, they were unwilling to put the quote in writing! Mendoza’s Painting & Remodeling were professional! Miss Jenny understood our needs and communicated with us to make us comfortable. The crew did a beautiful job. A project that could have taken us months to find the time for was completed with ease at a reasonable price and we are now enjoying our home instead of thinking of everything we need to do. This was definitely the way to go! We will contact Mendoza’s Painting & Remodeling for future projects." 5★★★★★ - "My experience with the Mendoza team was awesome. They worked hard, and were professional from start to finish. Everyone who has seen my newly painted home have asked who did your painting? So, if you need your home painted, I highly suggests that you use this company. You ll be glad you did! Great work, affordable rates and excellent job performed the guys are actually dedicated to their job and know exactly what needs ..."